· Brad Keselowski won the 58th annual Folds of Honor QuiktTrip 500 Monster Energy NASCAR Cup Series race at Atlanta Motor Speedway Sunday afternoon. For Keselowski, it is his 22nd victory in 271 Monster Energy NASCAR Cup Series races. 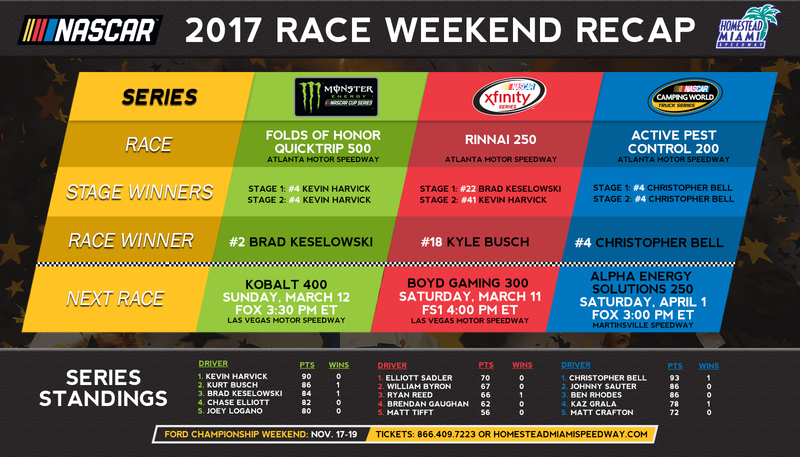 · It is Keselowski’s first victory and fifth top-10 finish in nine career Monster Energy NASCAR Cup Series starts at Atlanta Motor Speedway. It was also Keselowski’s first win in the last 20 races overall. Prior to today, his most recent victory occurred on July 9 of last year at Kentucky. · A Ford now has won each of the first two Monster Energy Series races of the year, as Kurt Busch (Stewart-Haas) took the checkered flag in the season-opening Daytona 500 last week. 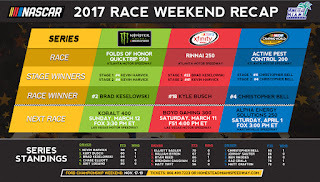 · For Team Penske, it is their 104th Monster Energy NASCAR Cup Series victory and their fourth at Atlanta Motor Speedway. · Kyle Larson (second) posted his second top-10 finish in four Monster Energy NASCAR Cup Series races at Atlanta Motor Speedway. · Matt Kenseth (third) posted his 17th top-10 finish in 29 Monster Energy NASCAR Cup Series races at Atlanta Motor Speedway. · Erik Jones (14th) was the highest finishing rookie. · Kevin Harvick, who led a race-high 292 laps today, won both Stage 1 and 2 of the Folds of Honor QuikTrip 500. · Kevin Harvick (90) leads the point standings by four points over Kurt Busch (86). They are followed by Brad Keselowski (84), Chase Elliott (82) and Joey Logano (80). · With the win, Brad Keselowski becomes the second driver to qualify for the 2017 Monster Energy NASCAR Cup Series Playoffs, joining Kurt Busch, who won the Daytona 500 last week. The Playoffs culminate with the Ford EcoBoost 400 championship finale on November 19 at Homestead-Miami Speedway. · In nine career Monster Energy NASCAR Cup Series starts at Homestead-Miami Speedway, Brad Keselowski has posted three top-10 finishes and two top 5s. He finished third in the 2014 and 2015 Ford EcoBoost 400, his career-best finishes at Homestead-Miami Speedway. Keselowski celebrated his 2012 Monster Energy NASCAR Cup Series championship at Homestead-Miami Speedway. · Kyle Busch won the 26th annual Rinnai 250 NASCAR XFINITY Series race at Atlanta Motor Speedway on Saturday afternoon. It is Busch’s 87th victory in 329 NASCAR XFINITY Series races. · It is Busch’s second victory and 10th top-10 finish in 13 XFINITY Series races at Atlanta Motor Speedway. · Brad Keselowski (second) posted his sixth top-10 finish in eight XFINITY Series races at Atlanta Motor Speedway. · Kyle Larson (third) posted his fifth top-10 finish in as many XFINITY Series races at Atlanta Motor Speedway. · Brad Keselowski won Stage 1 and Kevin Harvick won Stage 2 of the Rinnai 250. · Sadler (70) leads the XFINITY Series points standings by three points over William Byron (67). They are followed by Ryan Reed (66) and Brendan Gaughan (62). · Christopher Bell won the 9th running of the Active Pest Control 200 NASCAR Camping World Truck Series race at Atlanta Motor Speedway Saturday afternoon. It is his third victory in 32 NASCAR Camping World Truck Series races. · It is Bell’s first victory at Atlanta Motor Speedway. · With the win, Bell becomes the second driver to qualify for the 2017 NASCAR Camping World Truck Series Playoffs, joining Kaz Grala, who won at Daytona last week. The Camping World Truck Series playoffs culminate with the Ford EcoBoost 200 championship finale on November 17 at Homestead-Miami Speedway. · Bell also captured each of the first two Stages of the race. · Matt Crafton (second) posted his ninth top-10 finish in 16 Camping World Truck Series races at Atlanta Motor Speedway. · Johnny Sauter (third) posted his third top-10 finish in seven career Camping World Truck Series races at Atlanta Motor Speedway. · Grant Enfinger (eighth) was the highest finishing rookie. · Bell (93) leads the point standings by seven points over Johnny Sauter (86) and Ben Rhodes (86).